am a big fan of Planeswalkers, and I always look forward to the new Planeswalker card(s) in every new set. My friend (who gave me the idea for this Arcana) and I even built a Cube based around my deep-seated love of the characters and their awesome cards. It's been a few weeks since we last talked about Born of the Gods's Planeswalker, so it seems like a good time to pull together everything we have on her into one handy place. Sound like fun? I hope so! Color: Blue, and a little green. Location: Standing on a rock amid a raging sea. 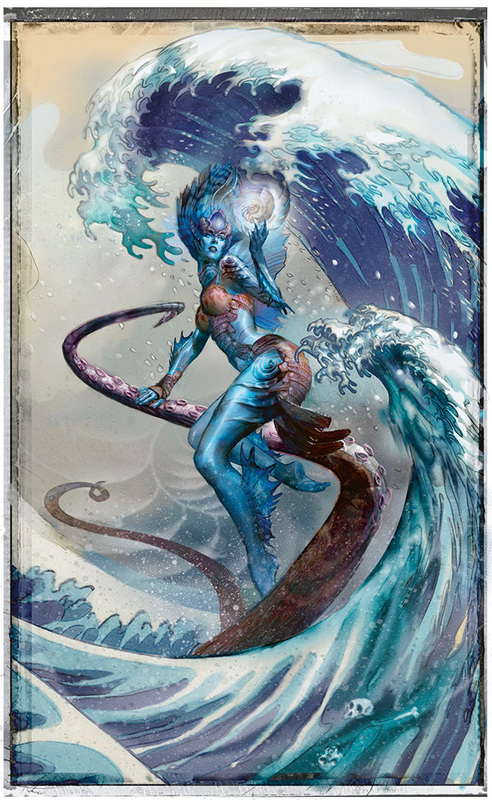 Action: Show us a new Planeswalker character: Kiora, a beautiful female merfolk who commands the powers of the depths. She is outwardly calm and collected but has an intense, wild look in her eye. Kiora venerates the huge creatures of the sea—krakens, leviathans, and other denizens of the inky depths—because for her they are evidence that even the most persistent forces can be endured: time, water, predation, and darkness. 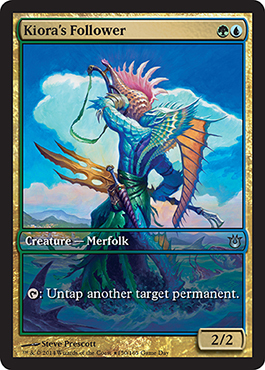 Focus: The merfolk Planeswalker Kiora. Mood: She seems calm and wise, but her dreams are bizarre beyond imagining. Notes: "Hair" is long, draping fin material like a Siamese fighting fish (Betta splendens). "Crashing through Winter"—We wanted to gift you with a feature on a day we normally only run rerun articles. Surprise! "Wallpaper of the Week: Kiora, the Crashing Wave"—The corresponding wallpaper. "Planeswalker's Guide to Born of the Gods"—With background information on Kiora (and five more gods of Theros). "Developing a Planeswalker"—Where Sam Stoddard explains how development arrived at Kiora's numbers. "Born of the Gods Tokens"—Including the two kinds of tokens Kiora makes: Kraken and emblem. "Born of the Gods Foil Underprints"—One of which is, of course, Kiora! "Kiora's Followers"—Kelly Digges's Uncharted Realms story about Kiora's arrival on Theros. I hope you ultimately create some Krakens!